Retail Sales Rose As 2012 Ended; Inflation Remained In Check : The Two-Way Consumers were still in a spending mood in December, even as lawmakers battled over the budget. Meanwhile, wholesale prices fell slightly. Those are both good signs for the economy. 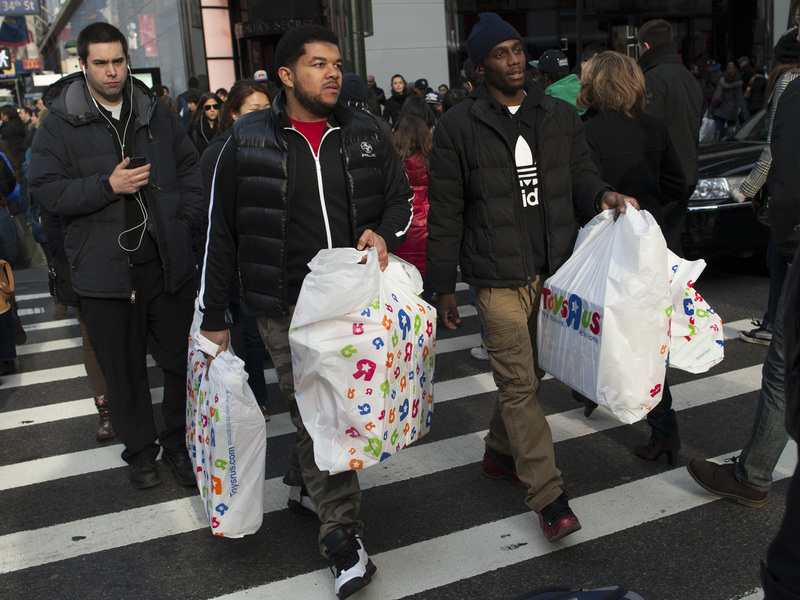 Shoppers in Manhattan on Christmas Eve last month. Retail sales rose 0.5 percent in December from November, the Census Bureau says. That may be a sign that as 2012 ended consumers were still in a shopping mood even as lawmakers in Washington struggled to keep the federal government from going over the so-called fiscal cliff. Bloomberg News says the better-than-expected sales figure, which is adjusted to hopefully smooth out the effects of the holidays and show the "real" growth, is a sign that consumers were looking "beyond the year-end budget battle among U.S. lawmakers." "Consumers continue to spend at a decent pace," Russell Price, senior economist at Ameriprise Financial Inc. in Detroit, told Bloomberg. Such spending is critical: Consumers purchase about 70 percent of the goods and services companies produce. For the year, retail sales were up 5.2 percent. Also this morning, the Bureau of Labor Statistics reported that wholesale prices declined 0.2 percent in December from November and were up just 1.3 percent for the year.